You probably experience it every day. We're all pretty much aware of the things we need to do to keep our tresses strong and healthy—the right products, proper hydration, enough sleep, and a nutritious diet. But despite having a solid haircare routine, you still find yourself having bad hair days. 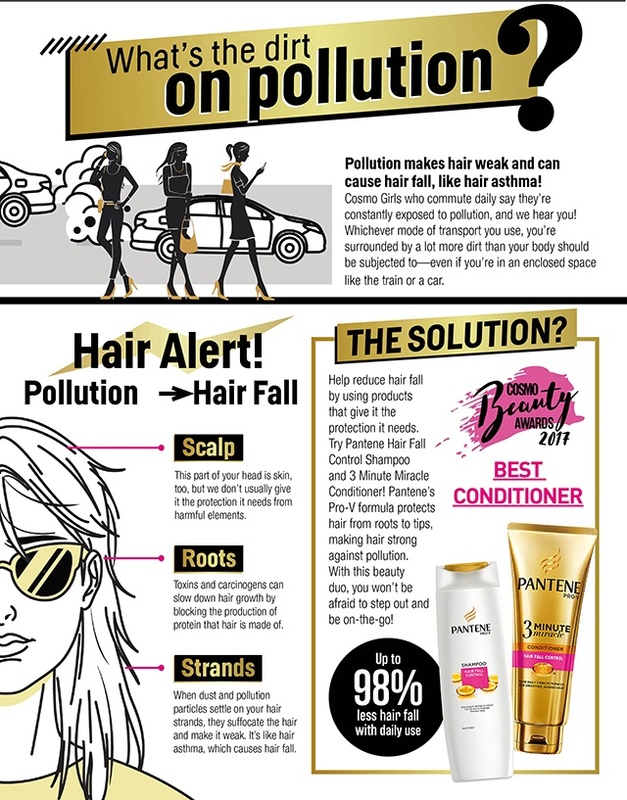 While we're well aware of the common threats to our hair, the biggest one is often overlooked: Pollution. Pollution actually makes hair weak, leading to hair fall (like hair asthma!). Terrifying, right? Pollution knows no bounds and it may be taking a toll on your overall look. That's why it's important to start protecting our tresses, especially if you live in the city. Here's a tip: Treat yourself with Pantene Hair Fall Control Shampoo and 3 Minute Miracle. Pantene, with its Pro-V formula protects our hair from root to tip, shielding it from pollution and ultimately, hair fall. The environment is physically aging us faster than we should—but we can definitely do something about it. Fight hair fall with Pantene. Learn more about Pantene on their Facebook page.